New York — A summer exhibition at the Morgan Library & Museum celebrates an extraordinary bequest from acclaimed author and illustrator of children’s books Maurice Sendak (1928-2012). Best known for his 1963 picture book Where the Wild Things Are, Sendak was an avid music and opera lover. Beginning in the late 1970s, he embarked on a second career as a designer for opera and ballet. Opening June 14, Drawing the Curtain brings together nearly one hundred and fifty drawings from more than 900 by Sendak in the Morgan’s collection, including preliminary sketches, storyboards, finished watercolors, and painted dioramas. Also included are earlier works by Sendak on loan from The Maurice Sendak Foundation, and a number of props and costumes.This is the first museum exhibition dedicated to Sendak’s set and costume designs, offering new insights into the artist’s inspirations and creative process. Like his children’s book illustrations, Sendak’s designs for the stage embody his singular hand, his fantastical mode of storytelling, and his keen—sometimes bawdy—sense of humor. Drawing the Curtain: Maurice Sendak’s Designs for Opera and Ballet presents a wide selection of works from five of his most important productions: Mozart’s Magic Flute, Janáček's Cunning Little Vixen, Prokofiev’s Love for Three Oranges, Tchaikovsky’s Nutcracker, and an opera based on Where the Wild Things Are. These inventive designs demonstrate his exceptional skill as a visual storyteller. A selection of eighteenth and nineteenth-century works from the Morgan’s collection by artists who influenced Sendak will be displayed alongside his designs. Throughout his career, Sendak drew inspiration from his visits to the Morgan, particularly his encounters with the compositions of Mozart, and the drawings of William Blake and Giambattista and Domenico Tiepolo. The Morgan’s diverse holdings of music manuscripts, autograph letters, printed books, and Old Master drawings mirrored Sendak’s own wide-ranging passion for music, art, and literature. This will be the fourth and most comprehensive exhibition of Sendak’s work at the Morgan. The first took place in 1981, with drawings for Sendak’s deeply personal picture book Outside Over There and from his recent work on The Magic Flute. Both had been inspired by a visit Sendak made to the Morgan in 1977 to view drawings by Blake. This was followed by exhibitions of his illustrations for the Grimm tale Dear Mili in 1986 and drawings for the book Where the Wild Things Are in 2009, on the occasion of the release of a major motion picture adaptation. Sendak made use of the Morgan’s collections on at least two other occasions, including in 1987, when he leafed through Mozart manuscripts during the filming of the PBS documentary American Masters. Drawing the Curtain: Maurice Sendak’s Designs for Opera and Balletwill be the first major museum catalogue of Sendak’s work. It reproduces all works in the exhibition as well as additional works by Sendak and others from whom he took inspiration.The essays discuss the importance of music and movement to Sendak, the artworks that inspired his stage designs, and the historical and biographical contexts that formed them, providing critical insights into one of the twentieth century’s most important children’s book authors and illustrators. Author: Rachel Federman, with contributions by Liam Doona, Christopher Mattaliano, and Avi Steinberg Publisher: The Morgan Library & Museum and DelMonico Books -Prestel 208pages. 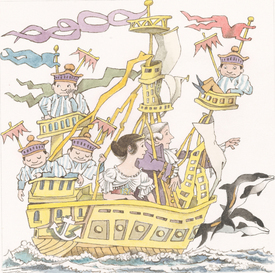 Image: Maurice Sendak (1928-2012),Ship (Nutcracker), 1982-4, gouache and graphite pencil on paper. © The Maurice Sendak Foundation. The Morgan Library & Museum, Bequest of Maurice Sendak, 2013.107:289. Photography by Janny Chiu.